Comments: Robert Barclay Moon was born in 1821 in Albemarle County, VA, and he was the son of John Digges Moon and Mary Elizabeth (Barclay) Moon. 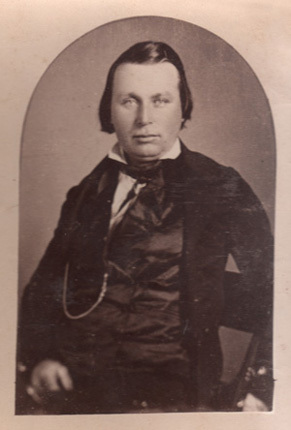 Robert graduated from the University of Virginia with a degree in civil engineering, and in 1846, he was appointed magistrate of Albemarle County. He also served as County Surveyor of Albemarle and was actively identified with nearly every movement which was for the benefit of the country and his neighborhood. Robert was also a member of the Baptist Church. On 29 October 1846, Robert married Mary Barclay Massie in Augusta County, Virginia. Mary was born on 5 July 1922 in Virginia, and she was the daughter of Nathaniel and Susan (Wood) Massie of Virginia. After their marriage, Robert and Mary Barclay Moon lived at Brookley, seven miles from Scottsville, and were the parents of three children: Charles Harden Moon; Hetty or Esther Moon, who died in infancy; and John Barclay Moon (1849-1915). Robert Barclay Moon died on August 14, 1891, in Albemarle County, Virginia, and he is buried at Mt. Ayre Cemetery near Keene, Virginia. In the 1910 U.S. Federal Census of Albemarle County, Mary Barclay (Massey) Moon was living with her son, John Barclay Moon, who was an attorney in Charlottesville. Mary Barclay (Massie) Moon passed away on January 31, 1911, and is buried at Mt. Ayre Cemetery. This photo of Robert Barclay Moon was provided courtesy of Cenie Re Sturm, Scottsville, VA. The photo was the product of Davis Gallery in Richmond, VA. 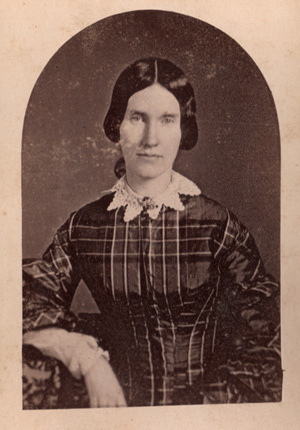 This photo of Mary Barclay (Massie) Moon was provided courtesy of Cenie Re Sturm, Scottsville, VA. The photo was the product of Davis Gallery in Richmond, VA.
1. Sketches of The Moon and Barclay Families Including the Harris, Moorman, Johnson, Appling Families compiled by Anna Mary Moon, Chattanooga, Tennessee, November, 1938; p. 10. 2. Marriages of Albemarle County and Charlottesville, Virginia, 1785-1929 by William L. Norford, (Charlottesville, VA: Jarman Printing Company: 1956), p. 131. 3. Chronicles of the Scotch-Irish Settlements in Virginia, 1745-1800, Extracted from the Original Court Records of Augusta County. Extractions by Lyman Chalkey (Baltimore: Baltimore Genealogical Co., 1965; originally published in 1912. 4. Mt. Ayre Cemetery, Keene, https://scottsvillemuseum.com/cemeteries/MtAyre/home.html . 5. History of Albemarle County, Virginia by Edgar Woods, (Charlottesville, VA: Jarman's, Inc.: 1932), p. 281-283. 6. 1880 U.S. Federal Census, Scottsville District, Albemarle, County, VA; Enumeration District 9, 16 June 1880, p. 25. 7. 1910 U.S. Federal Census, Charlottesville Magisterial District, Albemarle County, VA; Enumeration District 1, 12 May 1910, Sheet 26B.